Mish's Global Economic Trend Analysis: Bank of Canada Admits Recession: Shades of Voldemort; The Solution: More Bubbles; Operation Twist Canadian Style? 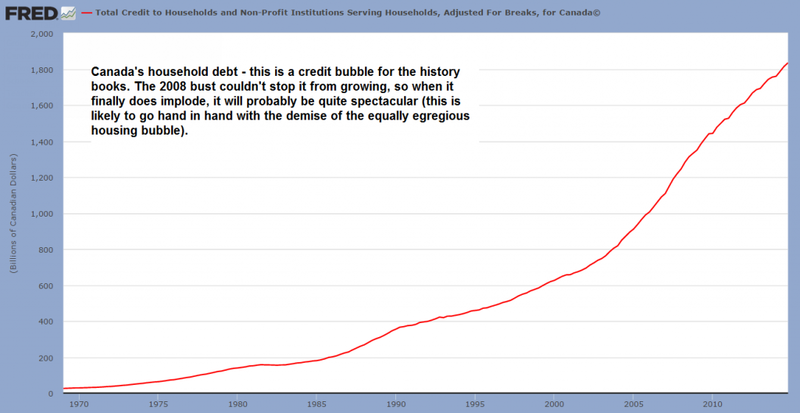 Bank of Canada Admits Recession: Shades of Voldemort; The Solution: More Bubbles; Operation Twist Canadian Style? Poloz further went out of his way to state the "R-word is unhelpful". Calling the Canadian recession was one of the easiest calls ever. I did so on January 31, in Canada in Recession, US Will Follow in 2015. What made the Canadian recession easy to spot was the Canadian yield curve inverted out to three years following a surprise rate cut by the Bank of Canada on January 21. It remains to be seen if the US follows. The US contracted in the first quarter, but the second quarter rebound was a bit stronger than I expected. On January 21, in response to the surprise cut, I wrote Canadian Recession Coming Up: Yield Curve Inverts Following Unexpected Rate Cut; Loonie at Six-Year Low. In that post I awarded Canada the "Blue Ribbon" for the first yield curve inversion of any major country following the great financial crisis. I am not aware of anyone else noticing or commenting on the yield-curve inversion at the time. Two consecutive quarters of GDP contraction are a sufficient but not necessary condition for recession. Indeed the NBER, the official arbiter of US recessions, has called the start of recessions in quarters in which GDP was positive. I have not seen anyone deny a recession when there has been 2 quarters of negative growth, "mild" or not, until now. The Globe and Mail amusingly claims Canada’s Fall into Recession Far from a Sure Thing. The question of whether Canada slipped into a recession in the first half of 2015 may depend on our definition of “recession.” And most of us have been using the wrong one, says one of the country’s top experts on measuring business cycles. Many commentators pointed at the Bank of Canada’s revelation this week that the Canadian economy likely contracted in the second quarter as evidence that the country met the “technical” definition of a recession: two consecutive quarters of declining gross domestic product. Indeed, much was made of Bank of Canada Governor Stephen Poloz’s unwillingness to even utter the word “recession” after the central bank’s interest-rate cut Wednesday. Apparently, if you don't like the word recession, you not only don't say it, you change the meaning of it. Then you need to do something to make the problem go away. The tried and true central bank method the world over is to blow more bubbles. We have recently portrayed Canada’s new central bank governor Stephen Poloz, to whom we have alternately referred to as a comedian and a delusional bubble blower. This may perhaps strike some readers as uncharitable; then again, central economic planning bureaucrats should be fair game, especially as nearly all of them are slaves to hoary inflationism and are apodictically certain to do grave damage to the economy, based on economic theories that at best deserve to be called a form of voodoo. It’s really that bad. As readers may recall, Mr. Poloz has continued where his fellow bubble-blower and predecessor Mark Carney left off, by keeping the bubble blown with all his might. We imagine he may be a bit intimidated by the truly daunting size the combined real estate and consumer credit bubbles have attained in Canada. To call them monuments to monetary megalomania would be an understatement. Among developed nations, only the bubbles in a few Scandinavian countries and Australia can hold a candle to them. We were therefore decidedly unsurprised when it emerged yesterday that the Bank of Canada has cut rates again – apparently the Canadian economy has entered an official recession, which must however not be mentioned. The above chart reads "This is a credit bubble for the history books. The 2008 Bubble couldn't stop it from growing, so when it finally does implode, it will probably be quite spectacular. This is likely to go hand-in-hand with the demise of the equally egregious housing bubble." Chart courtesy of Pater Tenebrarum. Pater also offered these pertinent comments. Several years go already about one third of Canadians reported in a survey that their debt worries caused them to have sleeping problems. We can certainly believe it. Stephen Poloz, comedian, gifted pantomime, delusional bubble blower and hoary inflationist, sprung directly from the John Law School of economics (just as the rest of the developed world’s central planners), is trying to prolong the bubble’s life some more. So far, he has been successful, but he is riding a tiger. The sooner such policies are discredited, the better it will be for all of us, even though the process is likely to be painful for many. Change 'likely' to 'will be' and many to 'nearly everyone, but especially those who got into the real estate bubble in the latter stages' and Pater is precisely correct. By the way, portions of the Canadian Yield Curve are still inverted, albeit very slightly. I compiled this list of rates today from Investing.Com. Note the inversion: 1M, 3M, 6M, 1Y, and 2Y yields are all higher than the 3Y yield. I smell an "Operation Twist" type move by the Canadian central bank to rectify this horrific "recession-signaling" condition. If so, the sweet spot for banks and hedge funds to front-run the trade appears to be 5Y or 7Y notes. Then again, some banks may already be in on it. I suspect some of them were not at all surprised by the surprise announcement in January. That's simply the way the system "works".